Some Very Happy Hard Rock Cafe Kids! Dining out with kids and allergies is absolutely not a treat and often times the staffs in restaurants are not knowledgeable on what is Gluten Free and what is not, or what might have nuts in it or not. Generally I call ahead and ask for the Manager or the GM on duty and run the allergy list and see if we can dine somewhere or not. Exceptional dining comes from exceptional staffs that understand and meet the neds of everyone not just those that dine without allergies and The Hard Rock Cafe Orlando exemplifies this by carefully paying attention to all those food details that so many of us take for granted: cross contamination, dedicated fryers down to the croutons on the salads. 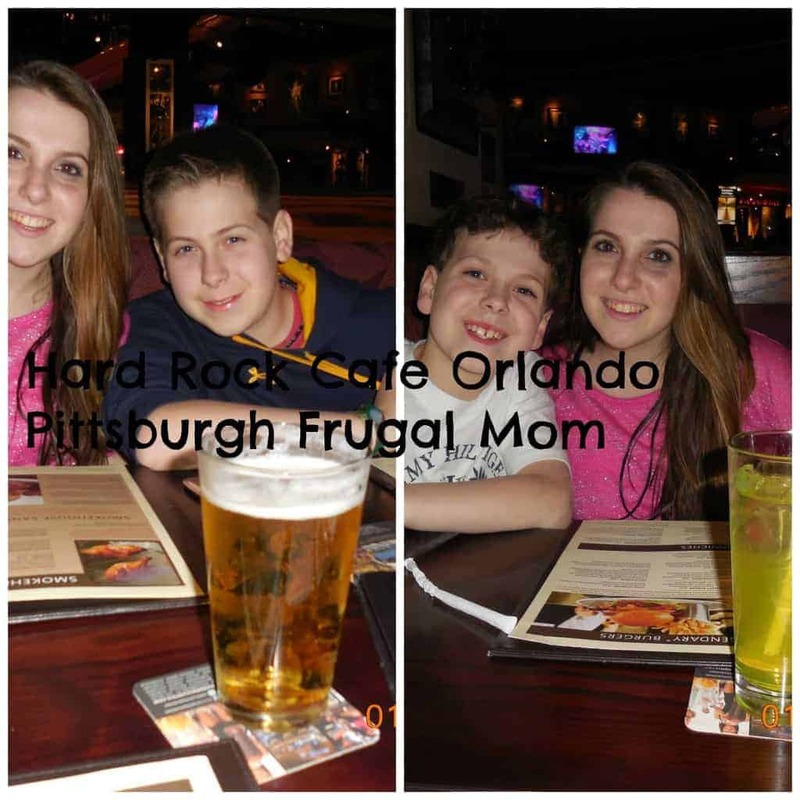 While we were in Orlando, we dined at the Hard Rock Cafe under the watchful eyes of their manager and staff and not only was it a great meal but it was one I would recommend. If anyone in your family has food allergies such as latex allergies, Gluten Allergies, Nut Allergies as well as Shellfish allergies, and you are by a Hard Rock Cafe, stop in, talk to the manager and get ready to dine on delicious food served with attentiveness. The smile you see on my daughter’s face is so rare anymore. Her gluten allergy has changed her life and while she is managing the allergy, it has thrown a wrench into the works as it is more difficult to make food choices based on gluten free foods. The smile she had rocked out the restaurant and made me so happy. I have to tell you her burger was great and she ate it all, and the bun was gluten free. The fryer was dedicated so that meant her fries were never in danger of cross-contamination with other things that had breading, and gluten. Kaleigh was so happy to have a burger with a bun for a change! As for me, a vegetarian, I was thrilled to find this burger on the menu and yes I made it disappear, as I was famished from walking around Universal Orlando all day. My one son is deathly allergic to latex, shellfish, nuts, many fruits and much more, but we got him accommodated with a burger, fries(in a dedicated fryer so no cross-contamination), a bun with no traces of nuts and a salad with everything BUT croutons on it. No latex and a perfect night. He emptied his plate as well because it was so good. He is only 10 so he ate from the kids menu. 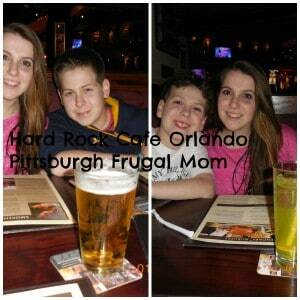 Now what might come as a surprise to you is the pricing at the Hard Rock Cafe. As we were telling a few of our friends they were saying it must have been expensive, but in reality, our meal was under $100 including alcohol. That was a meal for 5 people in Universal on CityWalk, so my point is the price was family friendly and the meal was safe. The Hard Rock Hotel is a few minutes of a walk from The Hard Rock Cafe making this a super convenient stop. Of course after we ate the kids wanted to ride some more, so they did, even with full bellies. After dinner the little bit of a walk is a great way to digest your food and the surroundings are so pretty it actually makes a perfect date night. If you have tweens, teens, or are traveling in larger parties, they can seat you, as we saw many parties going on while we were there. The dress was casual, we did jeans, but others were dressed up more and some were dressed down less, it is all up to you. The party upstairs had a group of teens all dressed in semi-formals for a birthday party, while down below there was a guy party going on and they all had khakis and tees on. 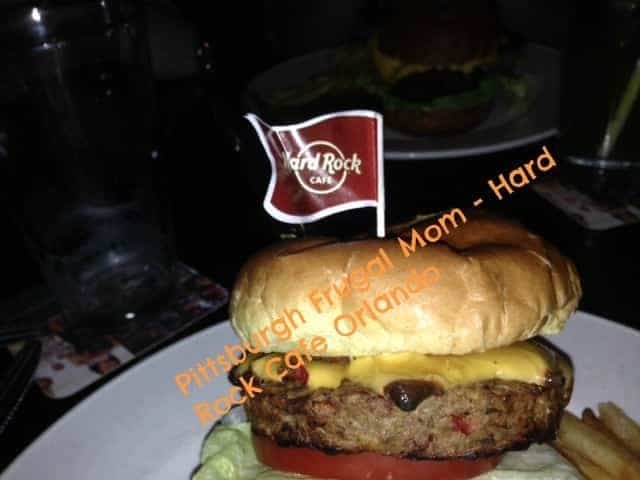 The Hard Rock Cafe Orlando is definitely able to serve you if you have food allergies like we listed, such as gluten free, nuts, shellfish etc., just make sure to speak to a manager when you get there. Don’t forget about your Hard Rock VIP card that I wrote about before and remember, rock on, rock hard and eat well at the Hard Rock Cafe Orlando. Do you happen to know if the Veg Burger was also Gf? I am a Celiac Vegetarian and I am supposed to be attending a party there tonight! OMG I would LOVE to be able to have a gf veg burger out in public!! !